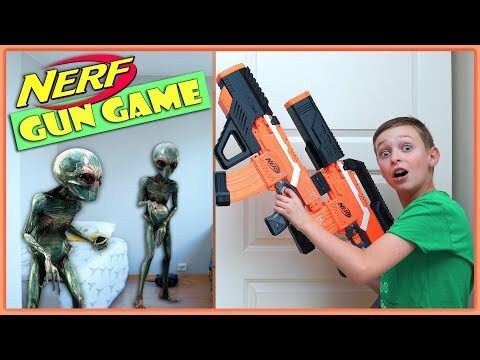 In this video, Roman is going to play a virtual reality gun game with his Nerf guns vs extraterrestrial alien creatures appearing in his house. Roman picks 6 different Nerf weapons for this battle, and so the game begins. Little does he know that this game would turn into a real alien invasion. This gun game is intended to simulate a video game and all characters are imaginary. Hope you like this video. Let us know in the comments if you did, hit that like button and subscribe to RM Bros.